Technology has a 360 degree round up effect around every individual in the present trend. Being smart is outdated but having smart is what makes sense nowadays. To start with let us choose the most essential element that illuminates your space. Yes, you are right!! Lighting up your sweet home to add some life, energy along with technology and make yours a smart home. The first thing that comes to your mind when you hear the word “LIGHT” is definitely energy efficient, durable and eco- friendly. 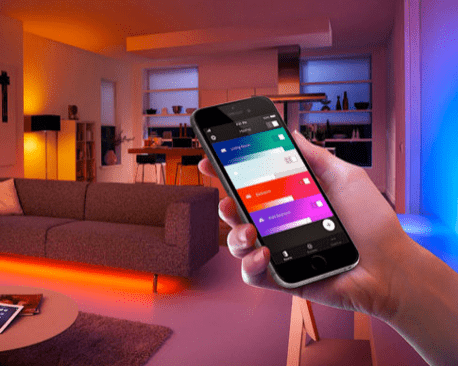 Philips Hue smart lights are a true mix of all your expectations. One of the best modern lighting solutions for a smart home. This wireless lighting system just follows four easy steps to turn on the best mood indoors. The bridge is the wireless hub that can be linked to Wi-Fi via router to your smart device. Can add up to 50 lights to one bridge, altogether under control when you are in and out of home. Set brightness, daily routine wakeup, quick control, change colors, widgets Apple watch and lots more to explore from the Hue App and also from others like Amazon Alexa, Apple home kit, Google assistant, Logitech, Nest, Xfinity Home that makes Philips the most connected light. Talk with these extraordinary lights with Amazon Alexa and control them from anywhere. Hue light strips are extremely fancy for party experience. Can be chosen to fill colors in any room. Sink it with music and these smart lights will swing along with tunes. Finally, now the total control of your smart home is in your palm. Don’t Wait… Just get ready to bring home many…. Previous story Go Away…. Stress! !